Argo fact vs. fiction: Why Argo’s inaccuracies matter. Over at Indiewire’s great new Criticwire blog, Matt Singer has declared that “Argo Is Totally Inaccurate—Which Is Exactly Why It’s Great.” Argo, Singer says, is a “love letter to the literally life-saving power of the movies.” By fudging its facts—including, as Singer readily acknowledges, just about all the details beyond its truly incredible premise—the movie only reinforces its point about how even fake movies have real power. I appreciate a good #Slatepitch when I see one, and I wish Singer were right: The movie he describes is much more interesting than Argo actually is. What kind of cinephile doesn’t like movies about the power of the movies? But Argo is not nearly as epistemologically savvy as Singer makes it out to be. It succeeds, wonderfully, as the kind of movie that can save your life from boredom for a couple of hours, but it fails as anything more than that. And one of the main reasons why? Its thematic incoherence when it comes to balancing fact and fiction. Consider the closing credits sequence. Affleck shows us stills of several of the movie’s key characters and scenes, as they were posed for the film, beside the real-life people and events they were based on. The images are near carbon copies—right down to the monster lenses of the film’s old-fashioned eyeglasses—and together they send a clear message: The real-life events really were just like what you saw here. In fact they were nearly identical. But Affleck doesn’t do these things, instead positioning the movie, somewhat disingenuously, as the real behind-the-headlines story of the rescue’s unsung heroes. In its closing minutes, it declares itself not to be “a love letter to the literally life-saving power of the movies,” but a pretty literal love letter to the life-saving power of one (fake) movie. And as the latter, it sells itself as more faithful than it actually is. That idea is also driven home by a scene just before the closing credits, in which the camera pans over Star Wars action figures while on-screen titles detail what happened to each of our real-life characters. The film’s greatest heroes, these titles explain, didn’t get the credit they deserved. Tony Mendez (played in the movie by Ben Affleck) received one of the highest honors in his field, the Intelligence Star, only to have it immediately taken back. (Because the mission was classified, the CIA couldn’t let the award leave the building.) The filmmakers recruited for the caper really couldn’t speak of their involvement to anyone. The United States’ efforts as a whole, as the movie has just shown us, really would go unsung. While crowds held aloft signs reading “Thank You Canada,” Mendez and the U.S.’s heroics would remain classified. The clever sequence is staged this way to highlight a remarkable contrast. Ian Mendez is the son of a real-life hero, but on his shelves what he keeps are not the would-be medals of his father but plastic action figures, from the movies, just like the ones that were selling in the millions all over the country. By choosing to celebrate Argo’s secret heroes over the image of these action figures, Affleck highlights how real heroes are not at all like the ones you usually see in the movies—and it’s the real ones, not the plastic ones, that he means to pay tribute to. Tony Mendez engaged in a much quieter kind of heroism, and like all the lifesavers that worked with him, he will not be getting his own action figure. Affleck might, though. 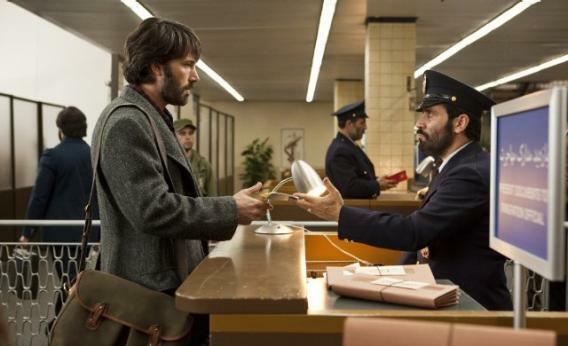 Despite its internal inconsistencies, Argo has been tapped as the likely winner of a golden one.